Psalm 137 is a sad dirge that records the Israelites’ lament in exile. They had been torn from their homes, their infants ripped from their arms; they had watched in horror as those homes were torched and those babies were dashed against stones. 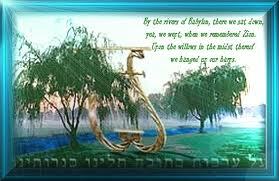 Forced to sing a song of Zion for their captors, the Israelites determined never to use those desecrated harps again and left them hanging on the branches of the Babylonion willows beside those Babylonian waters. We can also feel empathy with the persecuted church in every age, including our own, which has seen the most martyrs of any time in history. We can know that all the anti-Christian forces that array themselves against the Most High will be surely and thoroughly brought down. There may be ways that we feel as if we are in exile; that we feel as if our captors have taunted us and demanded a song. Psalm 137 reminds us that Israel’s exile eventually ended and ours will, too. Although the Israelites were so certain they would never again sing that they left their harps hanging on willow branches, a remnant was restored to their own land. They once again dwelled in Jerusalem; they again sang the songs of Zion. May God soon restore you from your personal exile. May you dwell again in Jerusalem and sing the songs of Zion! Thanks for your encouragement, Irene. To God be the glory!